The Natural Redstone is made of clay fired at very high temperatures, over 1.000°C, in a special furnace, before being ground. Redstone is also one of the ingredients of the Natural Grit which consists of oyster shells, silex and red stone. 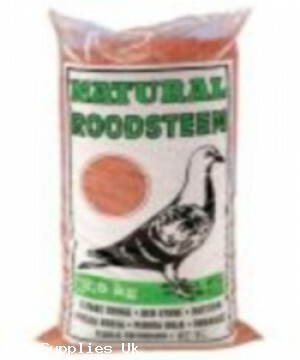 The Natural Redstone is rich in minerals and trace elements and pigeons just love picking on it. Before and after laying hens are in urgent need for it. The Natural Redstone is a 100% natural product and does not contain any appetite-enhancing substances.